School nearing an end means the end of, or at least a break from, educational reading. No more falling asleep on text books at 2 in the morning. No more looking up definitions for those big words–cough science majors. It is time to jump into a book you actually want to read. Starting a new book is kind of like starting a new adventure. It allows you to jump into a world you wouldn’t normally, or maybe you would, experience. The new world becomes a distraction (No one bring up Radway…) from the everyday. Recently, I’ve discovered my new favorite “world” in Gemma Halliday’s Spying in High Heels. Yea, most guys probably wouldn’t go for this one, but it was 99 cents on my Nook so I gave it a shot. Thank God I did. I am now addicted to the series, having just finished the second book this morning. What woman wouldn’t want to jump into the world of Maddie Springer, children’s shoe designer/fashion-obsessed/accidental detective? And considering it is written in first person, and this person is exactly like me, it is a super fast read. Check it out on Barnes and Noble. Graduation in 15 Days?? What? With Salve graduation only days away, I think it is safe to say I am not the only one freaking out. With most of our futures up in the air–I really dislike those of you who already have jobs–what should be a happy rejoicing time is now becoming filled with panic attacks. Last night at my workstudy job, my friend and I spent our night writing cover letters and sending out resumes. My friend and I both had panic attacks and were on the verge of tears within the first hour and a half of our shift, but not because of the pressure of picking the best way to word our should-barely-be-considered-work job at the computer labs to make it sound super important. It was because we spoke to our parents. While our phone calls we completely opposite, the outcome was the same. My friend’s father was pushing her and pushing her to contact this woman about a teaching job (she has already been in contact with the woman for a month, but of course that didn’t get through her father’s head), while my mom seemed like she couldn’t care less. All I got was “Stop worrying. Everything will work out.” MESSAGE TO ALL PARENTS: This line is never comforting. After taking a good 20 minutes to recollect ourselves, it was time for some music. My friend and I are infamous for playing fun songs loudly and dancing around the office on Thursday nights–if you’ve walked through the library basement on a Thursday between 6-9 I’m sure you have noticed–so this whole murky ora that had settled was not acceptable. I opened up iTunes and as soon as I hit play all the worry was lifted out of the room. Lesson of the night: Don’t waste time freaking out. Just turn on some good, bouncy, fun music instead. Here are the first 2 songs that kicked off a 2 hour dance party in the UCL. Alright. Alright. I know I just wrote about waking up to the sun shining being a great thing, and it is. I still hold firm to that statement. But I think there is something to be said about a quick midday thunderstorm. Maybe it is the relief that comes with the blue skies that follow. As I hinted at before, I’m spending my Easter at Camden Yards watching the Yankees take on the Orioles. A nasty storm just rolled through here. It went from sunshine to dark thundering clouds that were shooting out lightning bolts at what seemed like every two minutes. Still I was seated in my not-under-cover seat until they kicked me out just watching the storm. (Not to mention the rain felt really good on my sunburned shoulders. I told you it was sunny before) Needless to say there was a rain delay. Just watching this storm and the energy (no pun intended) is very humbling. You can see its power and the destruction it can do. That’s why it is always good to watch from a safe, inside location. But out in the staircase, where they allowed me to stand, I could see the blue skies in the distance. It was relieving to know that we were going to finish this extra inning tie game. Catching a ball at a major league game is something every fan hopes for. Little kids bring their gloves on the off-chance that one might come their way. Grown men wrestle in the stands as one bounces off the plastic seats. Getting a ball is such a rare occasion that for most (except for that guy that caught home run balls three nights in a row a couple years back) that it could be considered once in a lifetime. 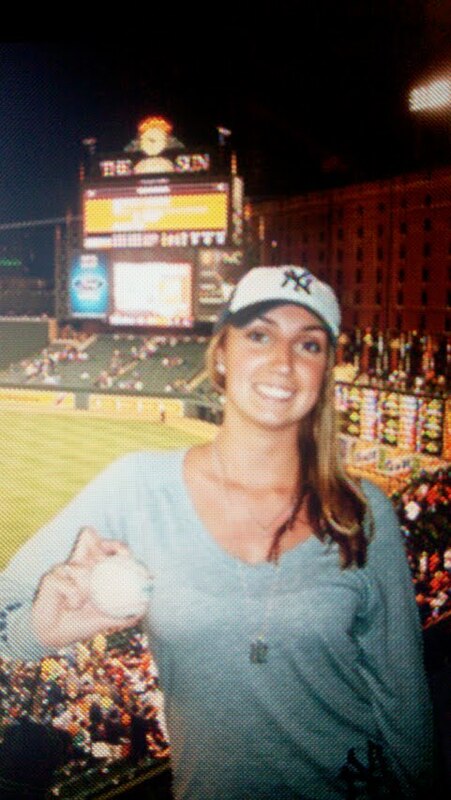 At last night’s Orioles game, I caught my first foul ball. By “caught” I mean it bounced all over my section and landed under my seat, but once I got it I was not letting it go. It’s the first time I have gotten a ball not in batting practice, (in batting practice the pitchers catching fly balls in the outfield tend to throw a bunch to the fans) so I was super excited. Waking up and seeing the sun shining bright outside the window is something most of us take for granted. It seems lately that we almost always expect it to be sunny (except maybe if you live in Newport where all it seems to do is rain) and anything else–clouds, rain, etc–is a let down. 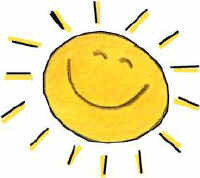 Anything but sun puts us in a bad mood for at least the morning if not the whole day. I don’t know about you, but when it isn’t sunny outside I can’t usually get up enough energy to do more than go through the motions of my day. I went away for the long weekend and today, the last day of my vacation, is the only day that the sun has been out when I woke up. In DC it was drizzly everyday and the clouds looming in the sky everyday did not make me super excited about walking around the mall. The sun finally came out yesterday afternoon and has been beaming ever since (well except at night when it’s supposed to be dark out). And today is looking even better than yesterday. I woke up to the sun shining and ready to take on a gorgeous 80 degree day in Baltimore. Whether in the deep voice of Leonard Cohen, the raspy voice of Jon Bon Jovi, or the soft voice of Kate Voegele as soon as I hear that first line “I’ve heard there was a sacred chord” come on it is like my mind is just at ease because the song is just so relaxing. However, it is almost ironic that I find it relaxing because the song is filled with so much emotion no matter who is singing it. Cohen just wrote so much emotion into the words it is hard no to empathize pain of heartbreak when listening to it. I invite you to listen to a few different versions below to get a better grip on what I mean. Most people find rain utterly depressing, and I agree with them… when it’s cold out. However, on days like today when it is pretty warm, I welcome rain. April showers always seem to be the most enjoyable. They aren’t needed to cool off like in the summer, and they aren’t an okay alternative to snow in the winter. There is something about laying in bed with the windows cracked and being able to just listen to the rain. It’s so relaxing. Take Sunday night, for example. Well, okay, really early Monday morning. I woke up around 4:30 a.m. (way before my alarm was supposed to go off) and just lay in bed thinking “It’s so nice to be falling back asleep to the sound of rain.” Of course that was before I realized the sunroof in my car was open. That was a nice wake up call. But minus that fact it was super relaxing. When it is just a little bit warm, the rain smells the best. I’m not sure why rain smells at all considering it is just water, but it always smells good in the spring. It just freshens everything up.